Once again, PWR New Media surveyed 200 journalists to learn about their news release preferences. 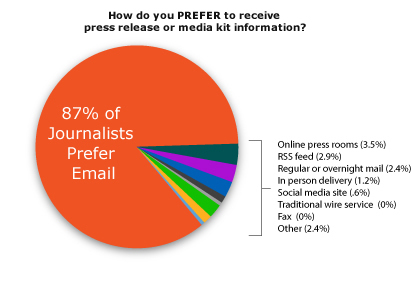 The main purpose of this portion of the survey was to find out how journalists want to receive news releases and what assets they want included with them. Most of our 200 respondents were from print outlets (31% from newspaper and 28% from magazine) with 12% from online. All media types were represented including bloggers. Although print was the dominant medium, a whopping 77% said they contribute to blog or other on-line site in addition to their traditional responsibilities (an increase over last year). This number just keeps growing, underlining the need for PR professionals to digitize assets in order to ensure their releases are usable across mediums. "Email is always best; supporting photography that I can easily download (not huge files, please); or, easily accessible links that do not require a computer genius to open, view and download; also, it is always appreciated to be able to quickly have a press/media contact, just in case additional info is needed." Not surprisingly, most said they “usually” receive releases via email but they also “sometimes” still get releases via regular mail, in-person delivery, and on-line newsrooms. A majority of respondents said they “never” get releases via fax, RSS feed or traditional wire services. Stop and think about that a minute, a majority “never” get releases via wire services, yet most PR professionals still use them...food for thought huh? More importantly, we asked how they prefer to receive releases. As in the past, an overwhelming majority, 87%, said email is the way they want to receive releases. On-line newsrooms came in at a very distant second place with 3.5%. Zero percent said they want to receive release via wire service or fax, while social media earned just under 1%. "Prefer emails for many reasons: ease of sifting through them, environmentally friendly, have capacity for back and forth conversation as well as links and attachments." "Email press releases should have product/service in the Subject line. I review beauty products and getting an email with a subject line such as 'Spring is in the air' is annoying. Better to say, 'New Spring Perfume from Coty' or 'Spring 2011 colors from Revlon' etc." To find out what assets they want to receive with releases, we asked how important “easy access” to various elements was to them. This year, access via link to relevant background, bios and supporting info was the most important with 91% saying that was (very) important. Release verbiage they could easily cut and paste was (very) important to 76% of our respondents, an element that has been high-demand in past surveys as well. As in the past, access to high res images was highly valued with 87% saying that’s (very) important. 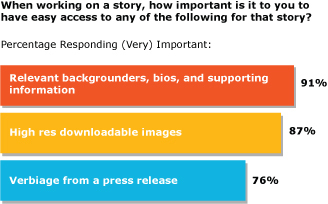 While the demand for images has been evident in past surveys as well, the variety of ways PR professionals can present images in releases grows: in addition to the 87% who want high res images, 44% want low res images, 32% want embed codes so they can easily grab and reuse images, and 22% want an image player that can be transferred to their own site(s). And don’t forget a downloadable logo: 41% of respondents told us that was (very) important as well. 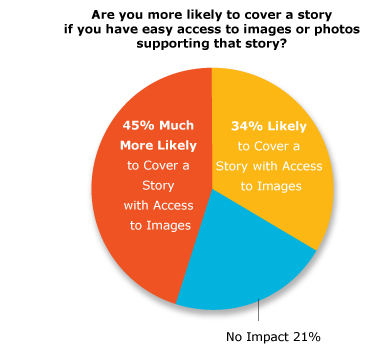 To find out whether or not access to images really made a difference in pick-up, we asked if they were “more likely to cover a story” if they had easy access to graphics or images and learned that, overwhelmingly, they are: 79% said images increased the odds of a release getting pick-up! "Prefer to receive images with release so I don't have to ask for them or go download them. Downloading adds to my time and I have to set up a filing system to make sure they match up with story. Please send high rez for print and low rez for Web." We think that’s great advice! The demand for video appears to have leveled out a bit but access to web quality video was (very) important to 30% of our respondents whereas access to broadcast quality video was only (very) important for 22%. Again, this reflects the growth in demand for web content. Twenty-three percent specified that an embed code with video, enabling easy transfer to other sites, was (very) important. Audio was (very) important to 23% and downloadable audio to 16%. Also reflecting a growing demand for, and use of, the web, content such as slideshows was (very) important to 21% and links to relevant blogs was (very) important to 44%. However, a chat box in a release was only valued as (very) important to 7%. In our open ended question, some journalists stressed what not to include in releases, most notably, attachments. "No large files or attachments"
"Mostly I get them through email, which is great. If it's a brand I love, I follow on FB or Twitter in order to stay current on new info as well." Stay tuned next month for more information on what we learned about new media and journalists. For charts with more details of this survey click here. And to read the unedited open-ended responses regarding news releases in full, click here. Finally, if you want to view past surveys, you can find results from our 2010 survey here and others on our website resource page, here.